Age 84 of Monticello died March 25, 2019. Bernard was born on June 2, 1934 in Urbank, MN to John A. and Margaret Schmidt. He was married to Marcine Wagner on September 23, 1953 in Millerville, MN. They were blessed with seven children. Bernie shared his talents as a master woodworker with family and friends, handing down his skills to four generations. 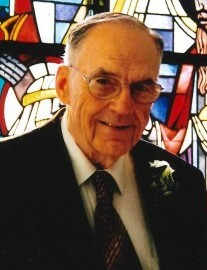 He was a loving husband, father, grandfather, great-grandfather and friend. As a man with a strong Christian faith, he served in many capacities with great love. Bernie is preceded in death by his wife, Marcine. He is survived by his children, Richard (Shelley), Elaine (Greg), Linda (Glen), Lois (Larry), Leon (Joanne), Debra (Chuck) and David (Barb); 14 grandchildren; 11 great-grandchildren. Visitation on Sunday, March 31, 2019 from 4-8PM at Church of St Henry, 1001-7th St, Monticello. Mass of Christian burial at 10:30AM on Monday, April 1 at the church, with visitation one hour prior.